What is most ironic as I begin this review of a book written by “The Great One” is the fact that at this time just last year, I reviewed Gordie Howe's autobiography, MR. HOCKEY, to which Wayne Gretzky added the back cover tribute. Howe was clearly a lifelong idol of his, and it is with a heavy heart that this new book must come out in the wake of Howe's passing. 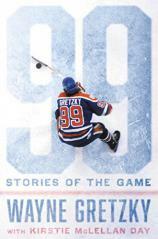 99: Stories of the Game is NOT an autobiography of Wayne Gretzky, but rather various hockey stories that include pieces of history coupled with highlights of his great career. It can be argued that Gretzky not only was the greatest hockey player who ever lived but could be the greatest player of all time in ANY sport. Imagine wrapping Babe Ruth, Michael Jordan and Muhammad Ali in their prime, and you will have some idea of the impact Gretzky made on the game of hockey. He did not just break records, he eclipsed them. A superstar NHL player might tally up 100 offensive points in a season (a feat that has become extremely rare in recent years). Gretzky at his peak was tallying over 200(!) points a season. "There are some great photos included in the book that hockey fans and lovers of 'The Great One' will cherish. Overall, 99 is a highly recommended read for sports fans and NHL enthusiasts of any age." The prologue speaks to how much hockey has changed in 99 years. For those who don't know, “99” was the jersey number Gretzky wore throughout his career. On the very first page of his prologue, Gretzky names the aforementioned Gordie Howe as his idol and discusses the impact he had on both an impressionable young player and the game of hockey itself. He goes on to give thanks to classic players at the advent of professional hockey, like Jack Gibson, the Patrick brothers (Frank and Lester) and Howie Morenz. It is Gretzky's respect for the history of the game coupled with his enthusiasm for hockey that make 99 such an important read. If the NHL received the same coverage it gets in Canada and across Europe and Russia, these stories would have that much more impact. Gretzky talks about his use of a hard stick and compares it to modern players like Shea Weber who excel at the slapshot --- and then laments how that type of shot has become less common in the modern NHL. In the chapter "The First Hockey Star," about Howie Morenz, Gretzky tells a story of a time when he and some of his Edmonton Oilers teammates --- Marty McSorley, Kevin Lowe and Paul Coffey --- left a practice only to go on an ice pond and skate around with some young boys. Hockey was so much more than just a game to people like Morenz and Gretzky --- it was a way of life. I would be remiss in not giving a shout out to the great Edmonton Oilers teams with whom Gretzky won four Stanley Cups. He is far too modest to sing their praises, but they are arguably the greatest hockey franchise of all time. We read about the formation of the NHL following the NHA of 1909, which featured one of the original six hockey teams, the Montreal Canadians. 1917 saw the beginning of the NHL under the guidance of the Patrick brothers and Conn Smythe (whose name is now on a trophy and formerly was the name of an NHL division). The Original Six are compared to the six teams in the Edmonton Oilers first Conn Smythe Division grouping in 1979 and how the competition between both sets featured some of the best top-to-bottom talent in the history of the game. The chapter "The Greatest of Them All" is reserved for Howe and will choke readers up. Gretzky guides us through the old WHA and the impact those teams had on the NHL when they entered in 1979. This is followed up by an extremely insightful chapter, "Inside the Miracle," about the 1980 Lake Placid Olympic Gold Champion Team U.S.A. Gretzky compares this to the Canada Cup battles in which he was involved in 1984, 1987 and 1991. He touches again on the current Olympics but recognizes that none have had the ability to grab the entire world (as well as the U.S.) as that 1980 classic. Gretzky talks about the mantle being passed from the great New York Islanders teams of the early ’80s to his own Edmonton Oilers squad --- a team that he labels as “The Last Dynasty.” Everything is wrapped up with a chapter entitled "I Just Love to Play," and that pretty much says it all. There are some great photos included in the book that hockey fans and lovers of “The Great One” will cherish. Overall, 99 is a highly recommended read for sports fans and NHL enthusiasts of any age.